The Daily News of Open Water Swimming: Where Were The Madswimmers In 2016? Where Were The Madswimmers In 2016? Courtesy of Jean Craven, Madswimmer, Planet Earth. Where was Madswimmer in 2016? Madswimmer was all over the globe: doing good, raising money, swimming far, adventuring courageously. For our 10 or 11 stalwarts (the maddest of the lot), the above swims work out at approximately 50 hours in the water and over 65 km worth of some serious freestyle - excluding extreme training." 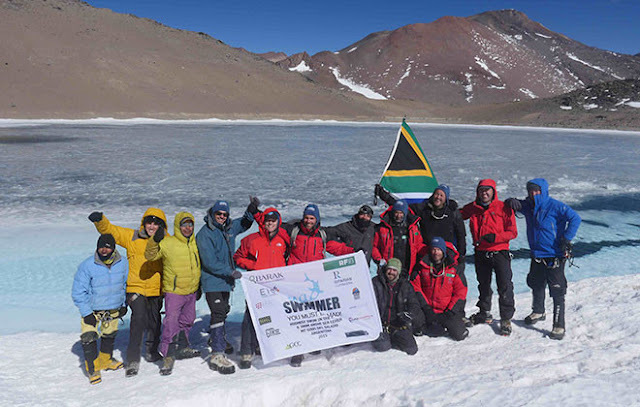 Their 2016 campaign began on December 5th last year when the Madswimmer team took to the mountains of Chile for Part One of the Hi/Lo Challenge - to achieve the highest altitude swim in world history – a feat recently acknowledged by Guinness World Records. Part Two of their Hi/Lo … swimming a hugely challenging 17 km across the Dead Sea. "11 Madswimmers formed part of an international team of 27 – to raise awareness to the plight of this magnificent natural resource," described Craven. "Despite some serious political and logistical challenges, as well as the real physical threat of death or drowning, the whole team finished the shore to shore challenge and reached the global objective of the swim, supported around the world." "Our swims have had far-reaching coverage, both locally and internationally. Our profile went through the roof with the team being interviewed on Sky News, CNN, BBC News, Carte Blanche and plenty of local media. The publicity has been amazing and it has raised our profile in the open water swimming world – a great step towards bigger swims and more funds being raised." Then there was Greig Bannatyne. He wore his Speedo armor to the airport on his return home [see here]. "We must mention the somewhat controversial, mostly entertaining stunt from one of our Malawi swimmers that went viral. All in the name of charity, we assure you, but he took some serious heat. While the rest of us swim our butts off to raise awareness, all you need to do is wear a speedo at the airport. Madswimmer already has some incredible swims set up for 2017 – including the Midlands Challenge and the Katse Dam Challenge in March, the Balearic Island Challenge in August, the Bazaruto Island Challenge in October, and the the Orange River Dash in November. "We are so incredibly proud and humbled by the commitment each of our swimmers has shown for each of the challenges this year. Through their efforts, we have supported 16 local children’s charities. This means a lot of love and a lot of lives being changed – none of which we could have done without family, friends and supporters." For more information, visit www.madswimmer.com or via email at contact@madswimmer.com.